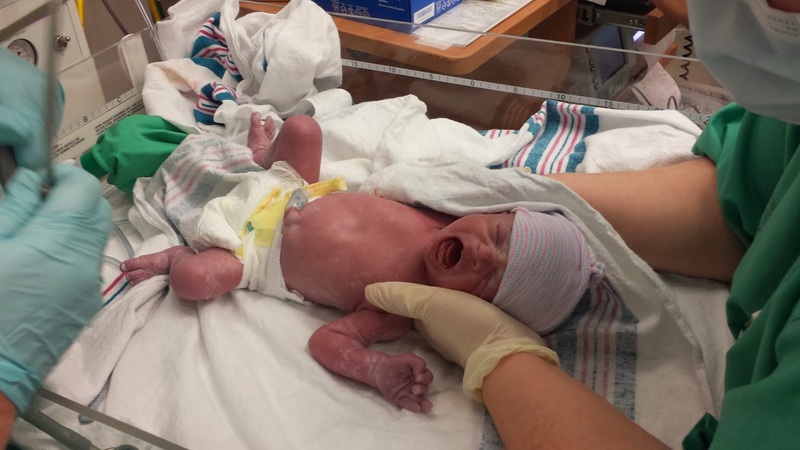 I had such mixed and powerful emotions over Cadence's birth that it took me several weeks to gather my thoughts and write it out. 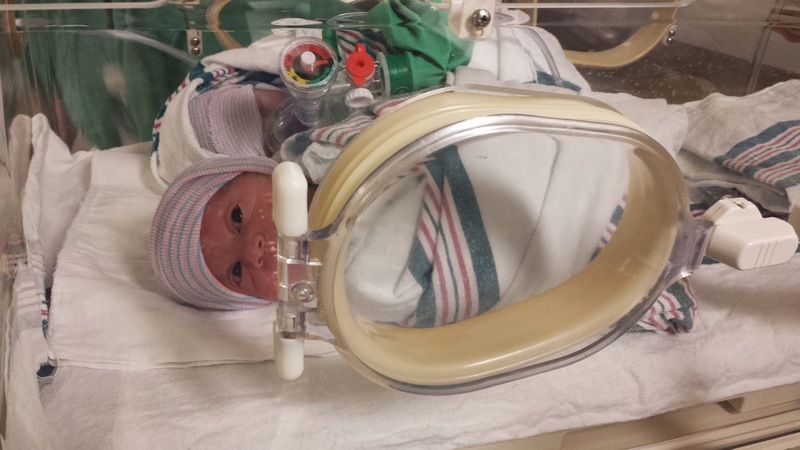 With the twins, things started out emotionally fraught but ended with a joyous high where I wrote out the whole experience on my phone once returned to my room while Ben was in the NICU with the kids. On the morning of February 3, 2014 I was 34 weeks, 3 days pregnant. Huge, increasingly uncomfortable, but generally in good health and spirits. I got out of bed to get dressed around 9:00 AM and felt a small gush of fluid. Ben was on the phone and I let him know I thought my water broke. As it continued to leak out I started repeating to him "Not pee, not pee! My water broke!" He hurriedly concluded his conversation. We were both shocked as this was quite early yet in the pregnancy and we thought we had several weeks left. I went ahead and took a shower as Ben packed his hospital bag and an overnight one for Cadence. He took her with him to mail packages and to finish last minute work at the office. In the meantime, I packed my bag and got ready for the big day, though I was still in a fog of disbelief. Internet research seemed to indicate that you could hold off up to four days after your water broke before inducing labor, so I was in no hurry to get to Labor & Delivery. A poorly aimed selfie, taken at 34 weeks, on my way out the door to Labor & Delivery. I arrived at the Saint Alphonsus hospital at 11:30 AM and was given the tests for amniotic fluid, all positive. Nurses Candy and Christina were assigned to me and Candy did an inconclusive cervical check. Still no contractions. An ultrasound was performed and discovered Baby A (Bentley) was head down, Baby B (Aria) head up. Dr. Rebecca McCaffrey came in and we discussed the options. 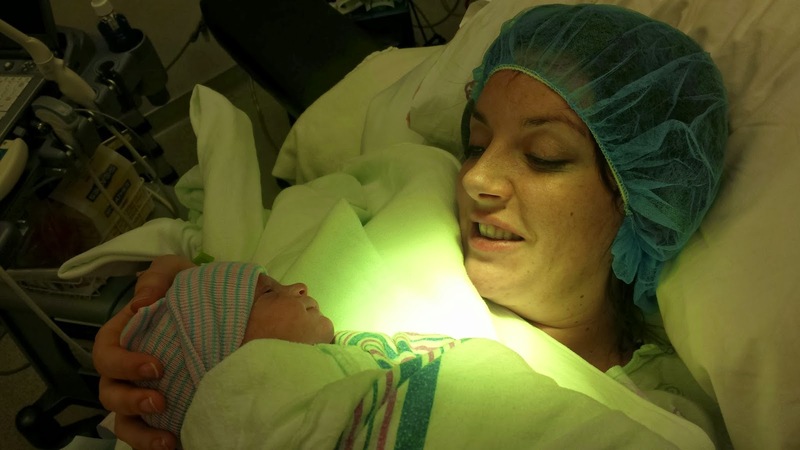 We could schedule a c-section, or could induce labor and hope that Baby B would flip. If she did not, there was a chance of the 'double whammy' where I would vaginally delivery Bentley but the need a c-section anyway. 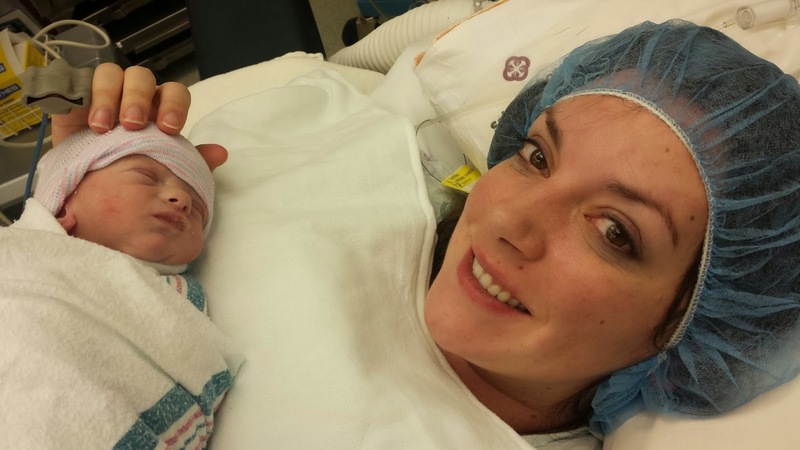 Dr. McCaffrey said in her experience, about 10% of the time a caesarean would be required. 90% odds of successful vaginal was a risk I was willing to take to enjoy an easier recovery and avoid major surgery, so I decided to go ahead with trying for a vaginal birth. I called Ben and let him know that they would be inducing labor so to grab me some lunch and head on over. When my darling Cady walked in, she heard the heartbeats on the monitor and timidly stated "Baby!" She approached the bed and I pulled her up to sit beside me. She patted my tummy and the babies, surprising me with how much of the situation she seemed to grasp. We had a quick lunch I barely tasted. The pitocin started but was at the lowest dose, so while the screen showed contractions, I wasn't feeling much. I could do this all day! We called around and found a place with my visit teaching companion, Amy, for Cadence to spend the night and set up with my visiting teacher Karen to watch her Tuesday. Thank goodness for that program! Ben left with my little girl and I settled in with a book. The nurses gradually raised my dosage ever half our or so, and by the time my handsome husband returned the contractions were like painful Braxton Hicks. Luckily, no back labor this time. We hung out for several hours, watching Superbowl commercials, reading, talking with mom, Aunt Diana, and Emily. etc. A NICU doctor came to answer our questions and fill us in on the possible complications a 34 weeker could face. That was quite scary and made me begin to wish I'd defied medical orders and stayed at home even a few more days. Around 6:00 PM, they let us know that the food service would be closing soon, so we put in it dinner orders. Contractions were getting very painful and quite close together, but our next nurse on duty, Liz, let us know I couldn't eat after an epidural so I worked through the pain in order to enjoy my beef pot pie and chocolate shake. Afterward, it was just short wait before Rob, our CRNA appeared to deliver blessed relief. The epidural seemed to take much longer than with Cadence. It didn't help that the contractions were coming every couple minutes. Or when Rob remarked he'd hit a vein and that I would have a bruise. I squeezed Ben's thumbnail with each contraction and his yelps of pain made me feel a little better. Finally, the epidural catheter was in place and they laid me down... only the contractions were still coming fast and heavy and things weren't feeling much better. Gradually, the pain lessened. I would have rejoiced, except I was retaining full feeling in a 2x6 inch strip along the left side of my tummy, a bit above where my leg joins my body. Rob advised that sometimes it takes awhile for the medicine to be fully effective. We waited a half hour, during which time painful contractions struck at about 3 every five minutes. Everything was pins and needles except this one swatch and that one hurt unbearably. Rob was standing by and listed the options, including the possibility of needing to start over. I was near despair, but the first option of switching medications solved all as each contraction was lessened until finally no pain. I still had pins and needles, developed a slight but constant nauseousness, and was rather uncomfortable in my bed. Oh, and later the shivers started. Still, I felt no pain and I was able to even get a couple hours of fitful sleep. After what seemed like ages, a team of nurses entered to transport me. The OR was quite different than my room. Bright lights, tons of machinery, and a pack of doctors and nurses. They moved me to the operating table and got me situated in the stirrups- much nicer than people holding my legs! Within minutes, I was bundled in warm blankets from the waist up and given a few sips of water and Dr. McCaffrey said it was go time. I gave a first push and she exclaimed, "Oh, a head full of hair!" She directed me to push again. "Again for the shoulders!" And with that third and final push, Bentley was born! He started squalling right away, a wonderful sound from a premature little guy. 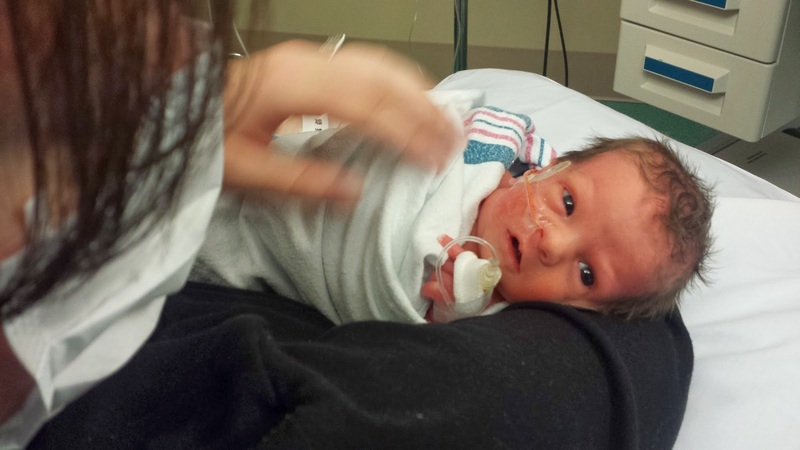 Dr. McCaffrey rubbed him up and cut the cord, then passed my beautiful boy to his NICU team. Ben came and reported "He looks just like me! He is doing great." I could hear the pride in his voice and read the joy on his face. It reminded me of the first time after the anatomy ultrasound where we found out we were having a boy. I said something about "our son" and Ben gave me the biggest smile. I know he loves his girls, but there was something really special about his joy over his first son. I kept blinking back tears of joy as I looked over at the team working on our little son, but there was more work yet to be done! 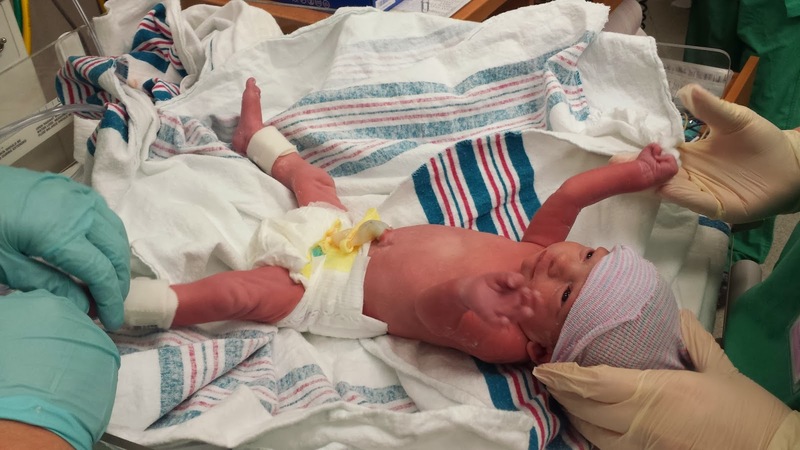 Dr. McCaffrey was reaching inside me trying to get a grasp on little girl to flip her while Dr. Bouchard manned the ultrasound machine to guide her. Little one was not cooperating, hiding in her slippery bag high up at the top of my uterus, so Dr McCaffrey broke the water bag. Little girl still didn't flip, so the doctor grabbed her little behind and helped pull her out, bum first. She didn't ask me to, but I felt the pressure and guessed I ought to be pushing. Luckily, Ben was back by my side because it all happened so quickly he could have easily missed it! After only two pushes, Aria was born, but it was definitely the most uncomfortable part for me. 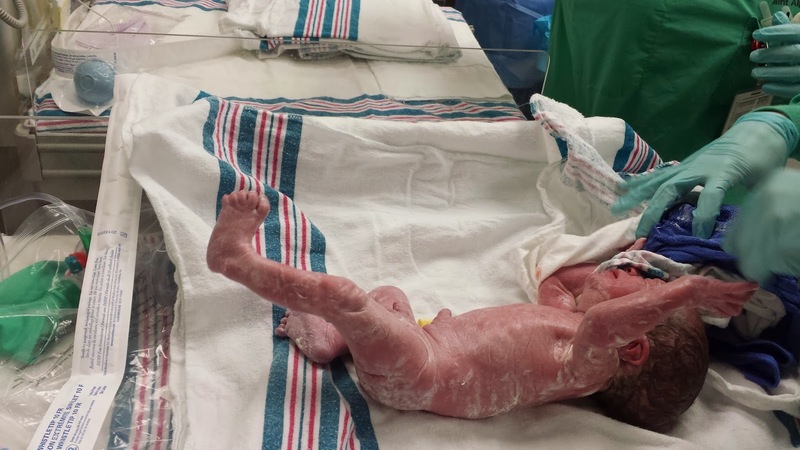 Aria, released from the womb, gets to stretch out! Baby Aria made me nervous because it took her awhile longer to cry and she was so tiny. After a few seconds that felt like forever, she gave some little delicate shrieks and was whisked away for clean up and evaluation. I followed the babies with my eyes while the doctor worked on delivering the placentas, a blood red tissue mass with two dangling purple cords. Then she pushed and pushed on my uterus, cleaned up the blood, and delivered the happy news- no tearing! At last, face to face with my Bentley! During the placenta delivery and clean-up, they brought my bundled little son over and laid him on my chest. He was so small and the spitting image of his daddy. He was pink and had the sweetest expression, which surprised me. When Cadence was born, she had the grouchiest look on her face. She was all red and just grumpy looking. I seriously considered asking them to put her back! Bentley was calm and serene in comparison. I talked to him while he struggled to keep his little eyes open, and we talked with his daddy. Having met him, Ben and I decided to forgo Camden or Calvin and name baby boy Bentley since he was a little miniature of his daddy. 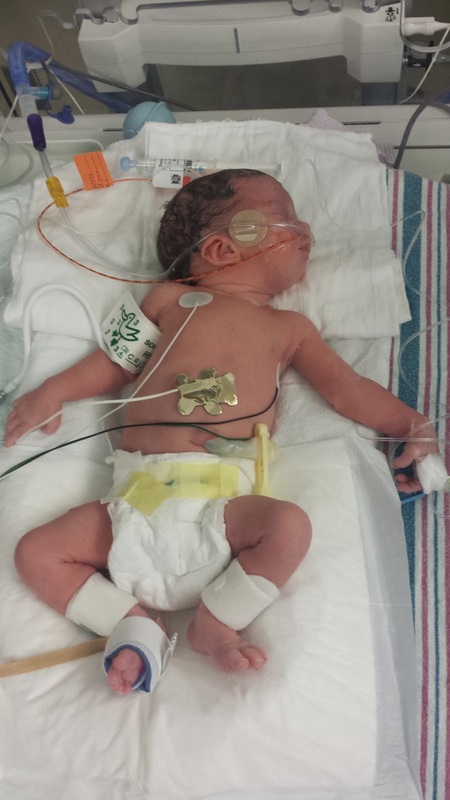 All too soon, the NICU team came to get him back in his warmer. Happily, the space vacated by my little guy was soon filled by his sister. Aria was so small and delicate, and was mewing like a little kitten. She looked so much like her brother, with the same sweet pink cheeks, though her demeanor was notably less serene. We discussed how unfair it was that she be yanked into the world so early when she was more than content to continue gestating within, and such an undignified entrance! Her eyes were open wide as she looked at me and let me know just what was on her mind. Oh how she mewed out her frustration! It made me want to name her Caitlyn, Kitty for short, but I needed time to discuss with Ben who had always loved the name Cecily, which would also fit my precious little kitten. Aria and I finally meet. 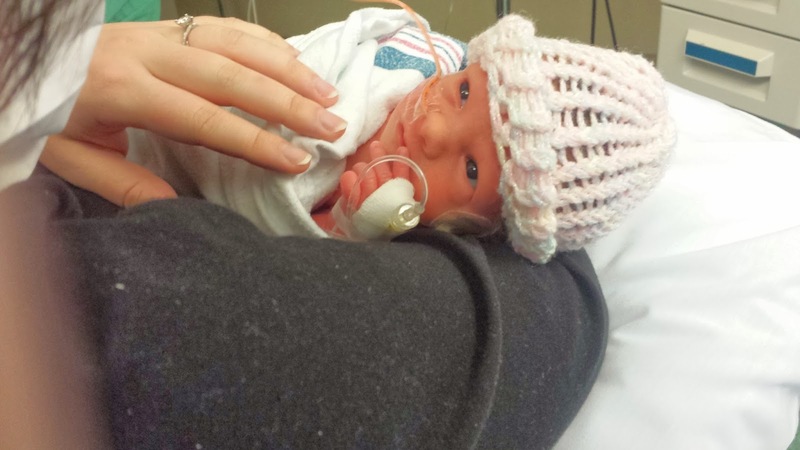 Soon they took her to get her on oxygen, and Ben went with the babies up to the NICU. I was cleaned up, wrapped in warm blankets, and moved back to my bed for transport back to my room. Everyone congratulated me on my beautiful children and the efficiency of the delivery. I thanked them all in turn for their roles played. On the way out of the OR I noticed the clock said 12:15 PM, so I asked the nurse what time the babies were born. Bentley came into the world at 11:49 PM and Aria was close behind at 11:55 PM. They came close to having separate birthdays, but I am glad they will share. Aria in her isolette. All the tubes and wires break my heart, but she looks so peaceful here. When Ben was able to rejoin me, he shared pictures of our darlings being measured and weighed. 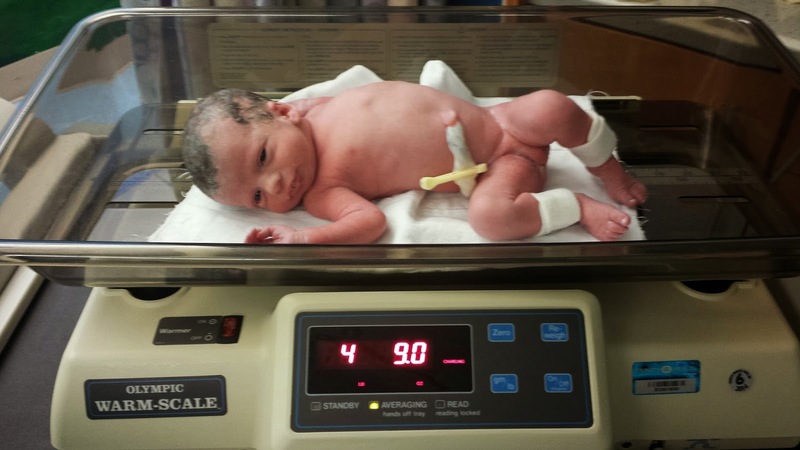 Bentley came in at 4 lbs 14 oz and 18'' long, while Aria was a dainty 4 lbs 9 oz and 17.5'' long. 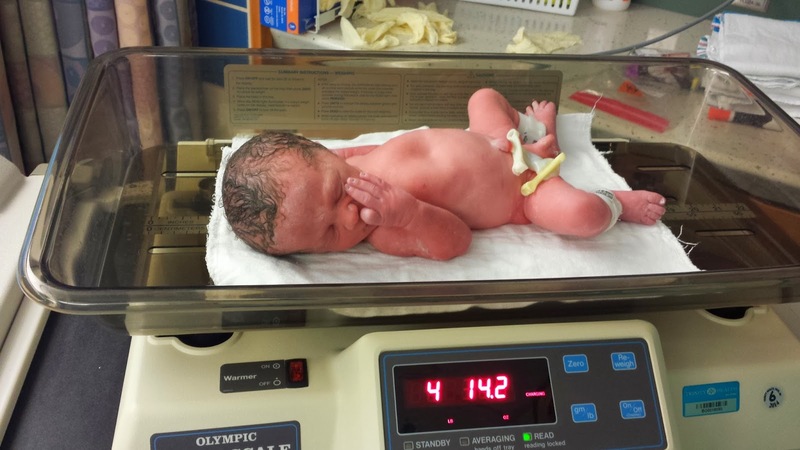 In comparison, Cadence, born at 40 weeks, was 7 lbs 5 oz and 19'' long. 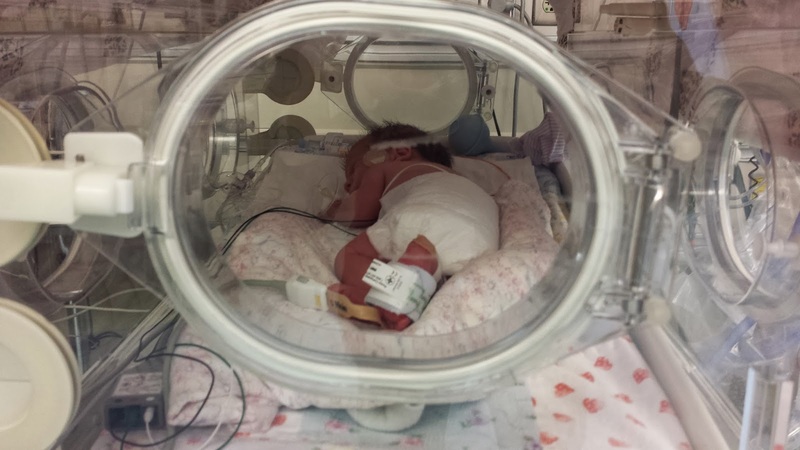 Over the next 24 hours, we were introduced to the NICU world. The babies both made immense progress overnight. The latest word when we left them at 3 AM was that Aria might require a lung x-ray and extra help beyond the oxygen supply. They also planned on waiting a week before introducing feeding tubes beyond the IV drip. By our next visit around noon the following day, Aria was off the supplemental oxygen, both were on feeding tubes and they invited me to try to bring Bentley to the breast. (He did great! He is a little champ. I adored getting to stroke his downy little head). Ben and I stood over yet-unnamed baby girl's isolette and debated- Cecily or Aria? Either seemed to fit her delicate sleeping features. We went over the pro's and con's of each lovely but different name. In the end, it seemed like the more we tried saying the names out loud, the more she looked like an Aria. And so, we decided to commit and fill out the paperwork. Aria is looking so bright and alert, this is 20 hours after birth. I think she looks a lot like Cadence here. By the last NICU visit of the day, we were allowed to hold Aria. I rocked her in my arms and we talked to her for a very sweet hour. From my water breaking yesterday morning to that special time holding my precious little girl tonight, it has been a very full and very special 36 hours. Benjamin and I are besotted with our tiny infants. How needlessly I worried if I had enough love in my heart for three babies. I still love Cadence just as much, but my heart has expanded capacity and I can already say that the pain and discomforts of pregnancy and labor have been abundantly worth the reward.